Definitely! Your consultation includes sampling from a variety of our delicious cake flavors, fillings, and frostings. Due to the small size of our bakery we request that you limit your party to no more than three people. It is helpful to have an event location determined, along with an approximate guest count, so that we may provide you with an accurate estimate. I need to meet with a consultant, when is the best time to do this? We want to give you 100% of our attention. Please click here to schedule an appointment with a consultant. Whether you need to make a payment, turn in paperwork, make changes to your order, or simply discuss ideas, we require that you schedule an appointment so that we can provide enough time to take care of you. Alternatively, you may give us a call at 916-737-5740 or email us at wedding@freeportbakery.com with any questions. Thank you! We have an extensive portfolio of our work for your viewing and we look forward to working with you to create the exact cake you would like. Please feel free to bring in any photos, fabric swatches, ribbon, cut-outs, or other inspiration pieces from which you wish to work. Yes, we deliver throughout the Sacramento area. At this time we no longer deliver to the Bay Area, Lake Tahoe or Napa Valley due to time constraints. 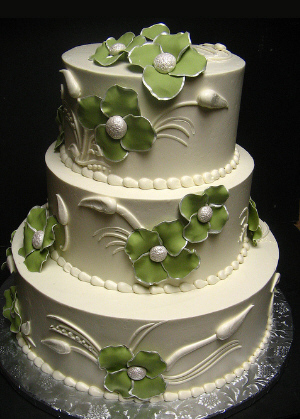 Unfortunately Freeport Bakery does not supply fresh flowers nor will we place them on your cake. You or your florist are welcome to place flowers onto your cake after we have delivered the cake or after you have picked it up. I’d like to ask you something specifically about wedding cakes. Do you have an email for that?